It’s really hard to walk down 1st Street and not wonder what is going on behind those covered windows at the soon to be Theater West End! If you’re a theater lover like I am then you may or may not be politely stalking the coming theater’s every move and patiently waiting for the plastic in the windows to be removed and to be invited to what you already know is going to be one of your favorite places to spend an evening. 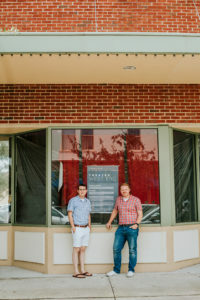 I was thrilled when owner Quinn Roberts and his business partner Derek Critzer contacted Sanford365 to sit and chat about the upcoming theater, and even more thrilled when Derek saved me from wandering aimlessly in the street when I couldn’t quite figure out which building their studio for rehearsal was! We sat in the middle of the room which is surrounded by full mirrors on one wall and vanity desks on the other walls, for cast members to prep themselves before each show. 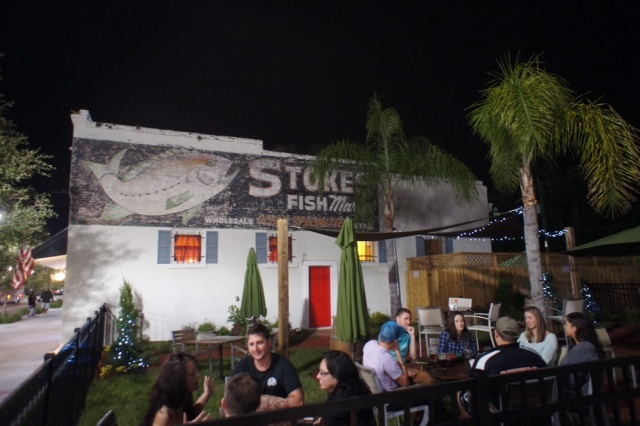 This second building sits just behind the theater and gives both Quinn and Derek as well as actors the space that is needed to prep before each performance. The floor plans for the actual theater were sprawled out in front of us and the guys began to speak with full enthusiasm about the overall look of the interior of the theater. I’m going to pause and tell you all how professional and well organized these two are. I must have told them that at least 5 times during our chat, but I was and still am just completely blown away by their attention to detail and theater knowledge. Now back to your regularly scheduled program…the theater will house one main stage, with stadium seating which will hold approximately 147 guests in their classic movie theater seats (which Jonathan the technical director and Derek drove all the way to Indiana to retrieve), there will be a full orchestra, Intelligent lights ( don’t worry I didn’t know what these were either) and a beautiful front lobby. One might wonder how these boys became so wise to the theater world…they’ve been living in it their entire life. Quinn graduated from Washington State and holds a degree in both Music and Business. 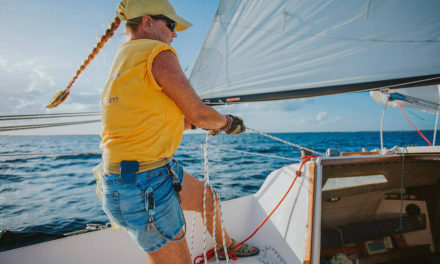 He did however step away from theater for a few years as he was thrown into the real world after college and worked in the mortgage business for a while, but his true passion kept calling to him, so he began doing theater and music locally. He performed with a local not-for-profit choir in Florida, The Garden Choir and eventually became president. Once Quinn got a taste of the acting world again, he knew it was exactly where he wanted to be. He was back in the arts world and meeting others who shared the same passion, such as Derek. Derek joked that he was born stage ready, but I don’t doubt it. In his 8th grade school year after a school production had been cancelled that he and his classmates were looking forward to, Derek stepped in and took the reins as he wasn’t fond of the way the performance department was doing things and he hasn’t stopped since. At a young age he worked backstage at the Ford’s theatre in Washington DC where he gained much of his experience. The men continued to cross paths and began speaking about opening up their own theater. 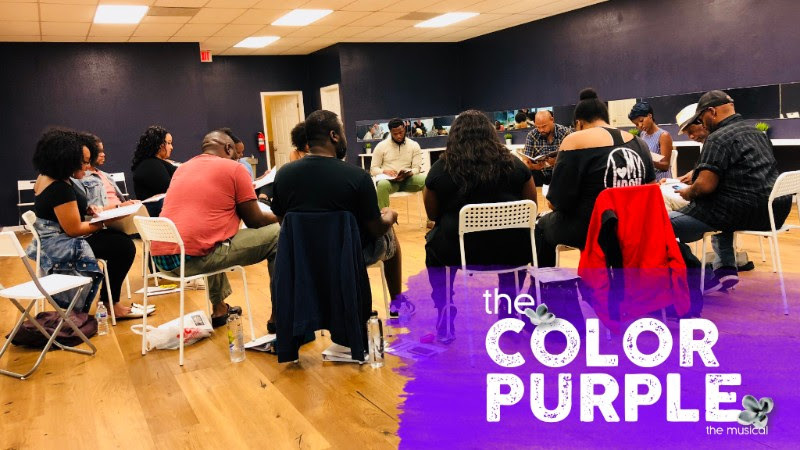 They both love the vibe and community of Historic Sanford – the city on the lake as they called it, so when the opportunity to arose they jumped on it and now are gearing towards their first show which will be The Color Purple. I was quite impressed when Quinn and Derek shared with me that they had over 60 people audition for this first upcoming play and then even more surprised when they played a clip of an audition tape – and I began to tear up…folks these guys know talent and it’s quite apparent that the world of arts knows that, too. 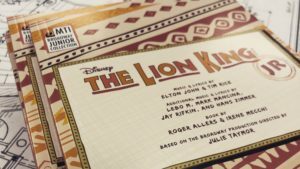 They had such a hard time trying to choose from all of the amazing auditions that they changed the cast number from 17 to 19 ( 3 of which are from the union…big deal in the world of theater! ), that’s 3 extra people that they are throwing into the mix for their first performance at their new location. 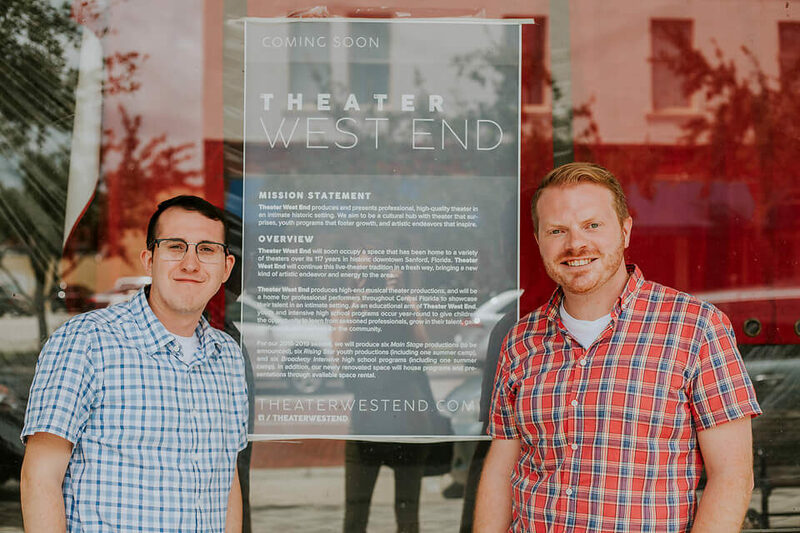 Quinn and Derek again are not novices to the theater world, they have been casting and putting on shows for Clandestine Arts and Fringe for years, but desired their own space and here they are, right in our historic district. 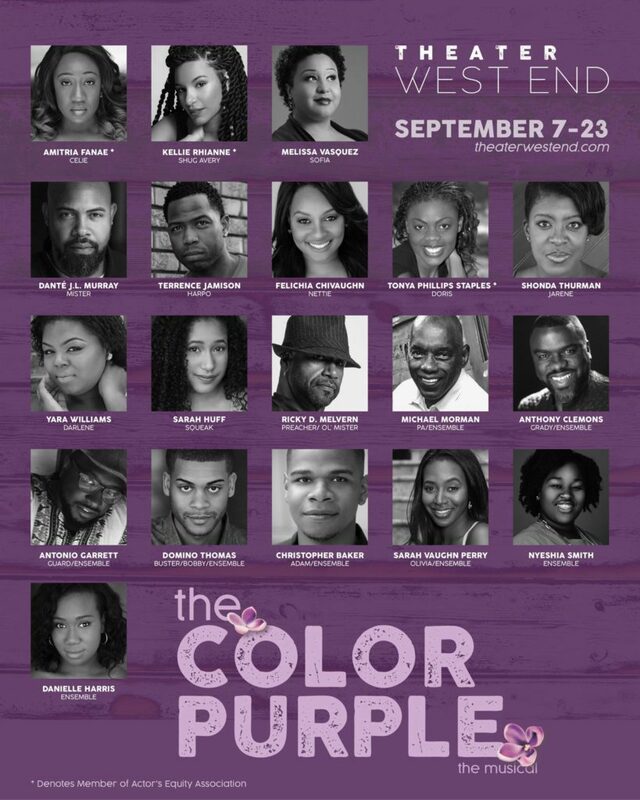 The shows that will be playing this year at Theater West End will consist of shows such as The Color Purple, The Bridges of Madison County, West Side Story, Ghost the Musical and more. You’ll also be able to enjoy a relaxing evening at their Jazz nights where wine and beer will be available, as well as concerts, and if you’re thinking about grabbing a bite to eat after a show be sure to check out their voucher options as they have partnered with local businesses such as The District, The Tennessee Truffle, Christo’s, The Smiling Bison, Hollerbach’s Willow Tree Cafe and the possibility of others to be added. And if you’d like to jump on stage or have kids that enjoy expressing themselves, Quinn and Derek have created some really awesome classes for kids in grades 2nd – 8th grade and kids in grades 9th-12th. The little ones classes will be more about teaching the kids to express themselves in a positive way on stage and letting them know that it’s okay to be silly. The older kids class will be more directive and intense and will teach the kids how to hone in on their skills and prep them for the professional theater world. With all of this said, it’s quite obvious that these two with their creative and business backgrounds make a great team. 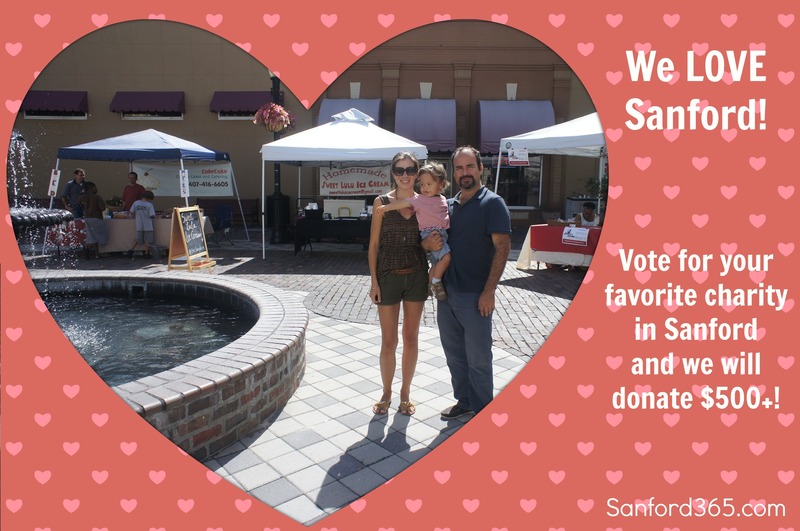 I for one am ecstatic and can’t keep my mouth shut about this place and if you’re too be sure to voice that to both, Quinn and Derek, and welcome them to our beloved Sanford! 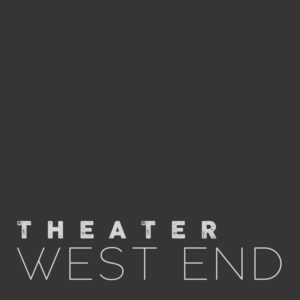 NextTake a NEW look at the WDPAC!